Animations are an extraordinary tool because they get you important information in a way that you can use it - fast. The animation above is from the Ocean Prediction Center. 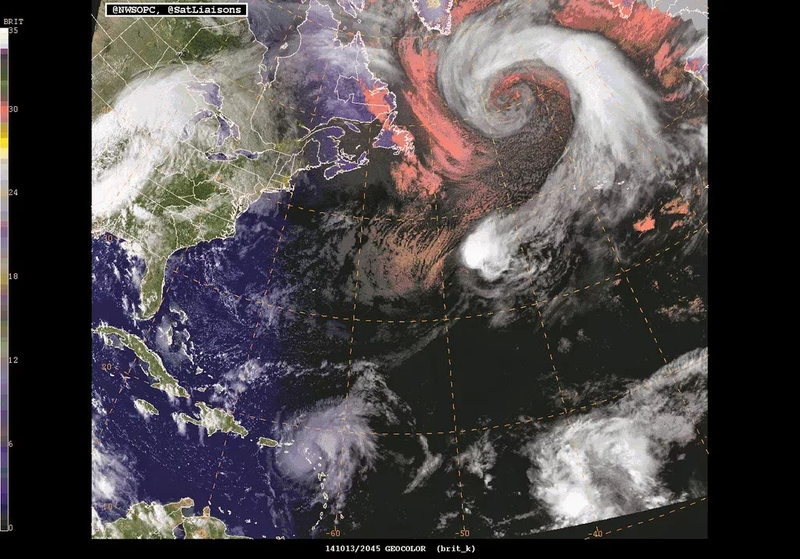 In mid-October 2014, a massive and spectacular storm explosively developed in the North Atlantic. The giant comma-shaped swirl expanded across almost the entire ocean basin. That is one big storm. The storm rapidly intensified. 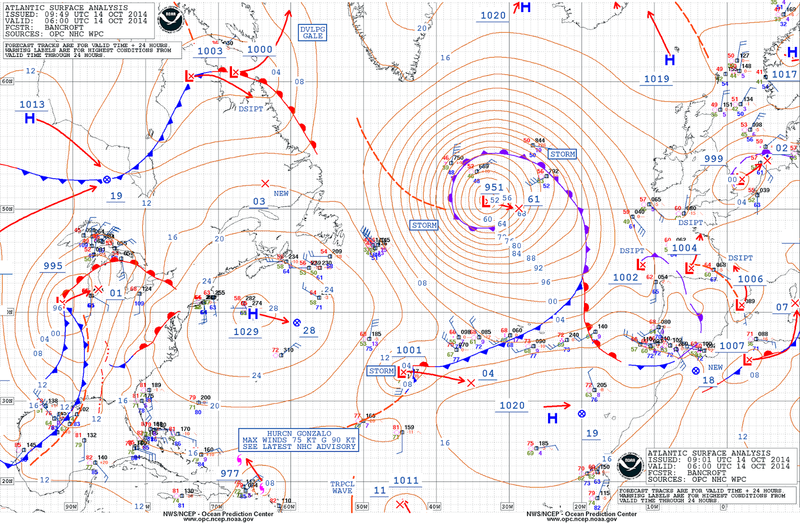 Its central pressure dropped 46 mb in 24 hours (from 1002 mb to 956 mb) – a textbook meteorological bomb. 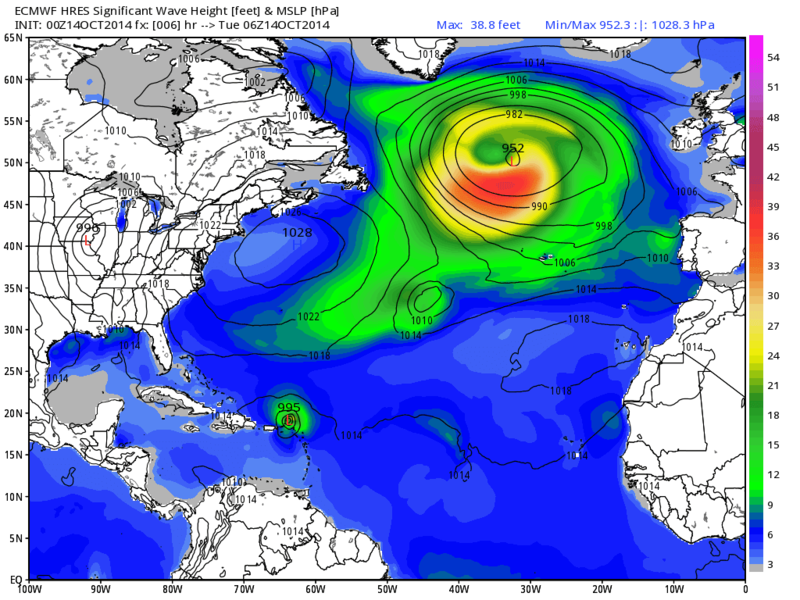 Late Monday on 13 October 2014, the storm’s pressure likely bottomed out around 948 mb which is comparable to levels in many category 3 hurricanes. The National Weather Service’s Ocean Prediction Center determined the storm had generated hurricane force winds just south of its center of circulation. The European model indicated maximum wave heights of around 40 feet in that zone.! Those are massive waves. There is just incredible amounts of cool information online about very practical things like this if you know where to look for it. And this is quite practical if you are sitting and waiting for that massive storm to hit some in the British Isles. Below are different pictures and schematics of the storm from various perspectives. 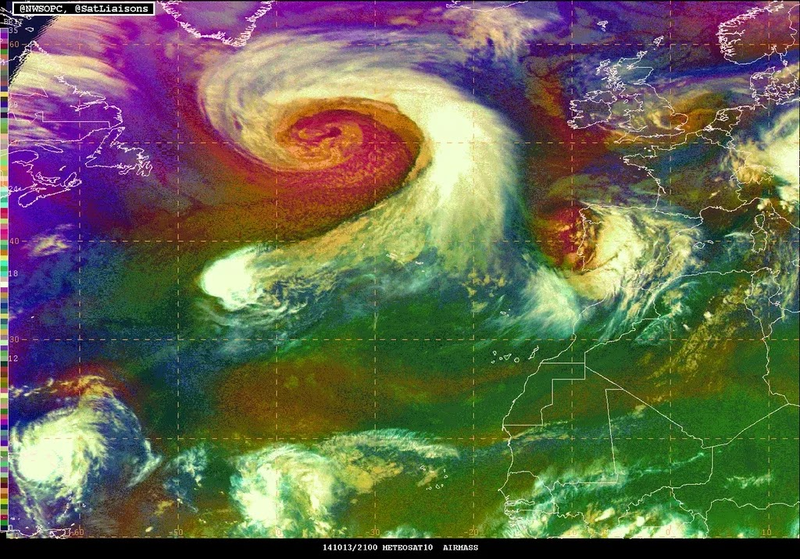 This animation shows the development of a hurricane force low in the Atlantic through the SEVIRI RGB Air Mass product and the Geocolor imagery. In addition, Hurricanes Fay and Gonzalo are shown to the south of it. Note: This video contains no speech or other audio information necessary for the comprehension of the content. It is best viewed in HD. The resolution can be changed by clicking on the gear wheel in the bottom of the video screen.